"Life isn't like a book. Life isn't logical or sensible or orderly. Life is a mess most of the time. And theology must be lived in the midst of that mess." The famous sticky hand given by our dentist...um, thanks. 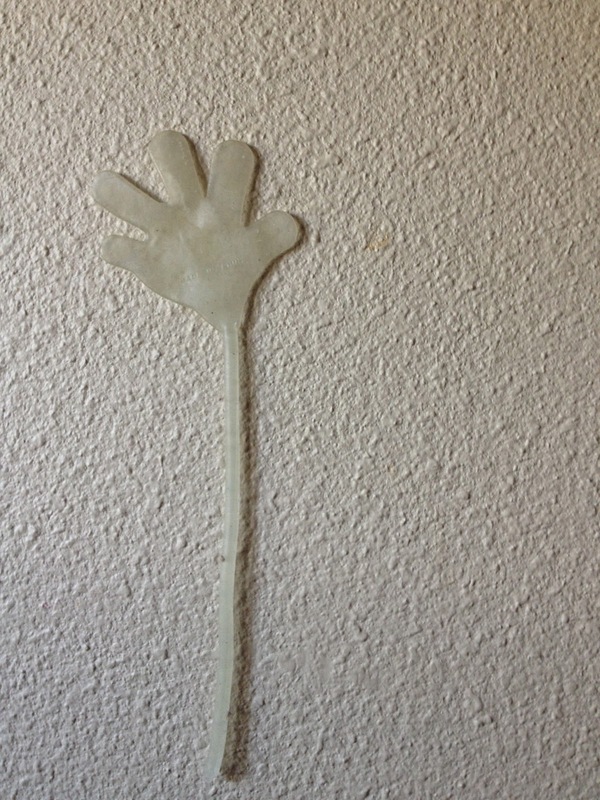 Yesterday it was dentist day for Caroline and in less than ten minutes upon entering our house The Sticky Hand was gracing our wall. Awesome! 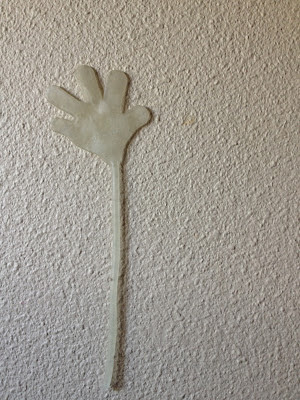 Random sticky, gooey hand-shaped object...how did this get to be an official prize from the dentist?? Only God knows. But like some sort of designer jean, it is the preferred item, searched for, carefully pulling and peeling away other inferior potential prizes, to find the goo hand. Just what my house needs -- something else hair can glom on. Could this be the cherry on the cake? Quite possibly. Like most of you, my house goes through its fair share of ups and downs. 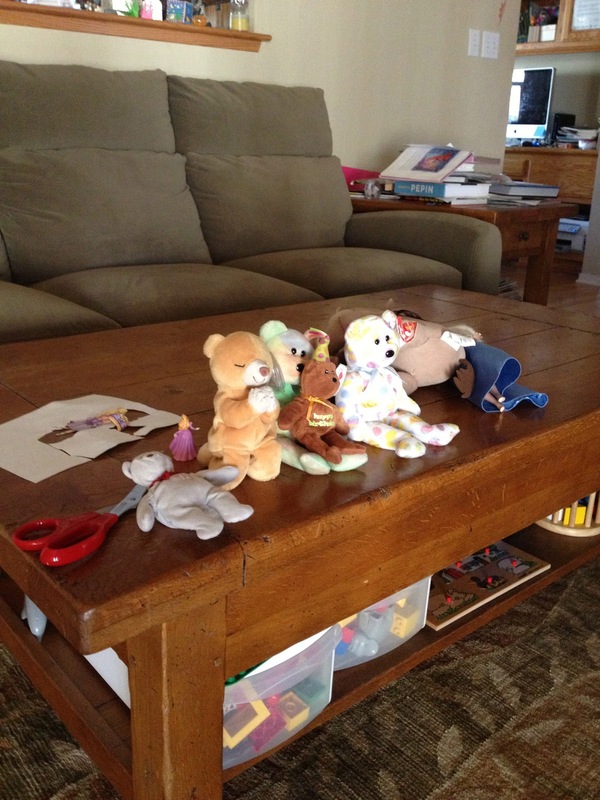 Clean for literally one minute before someone traipses something in, finds an amazing rock, decides to decorate something cardboard, pulls out a Barbie, stuffed animal, puppet, lego or puzzle piece just for fun. I try to get zen. Try to picture the story the items could tell. I try to recognize the steep bell curve of messes and know (literally: lived) the fact that the messes do stop...but when you're in the thick of a House Gone Wild it's hard to think clearly. Or better yet, fairy godmother, Harry Potter, Hermione, heck I don't care, someone wave that magic wand and make it all better. Yep, that mess is here to stay...unless I get going, put on some good music and get after it. Today I'm making my peace with The Mess. At least Ken looks happy. it's this day to day living that wears you out." How do you do it? Any hints? Special tricks? Fairy godmother 800 numbers? Yep, right now, this very minute, all sweaty, in jammies or worn down from the day. Which, in turn, means you are sacred. If we could have one life lesson taught to our children I would pick this...because then our kids would be able to make the leap...and know the truth...God makes no mistakes. 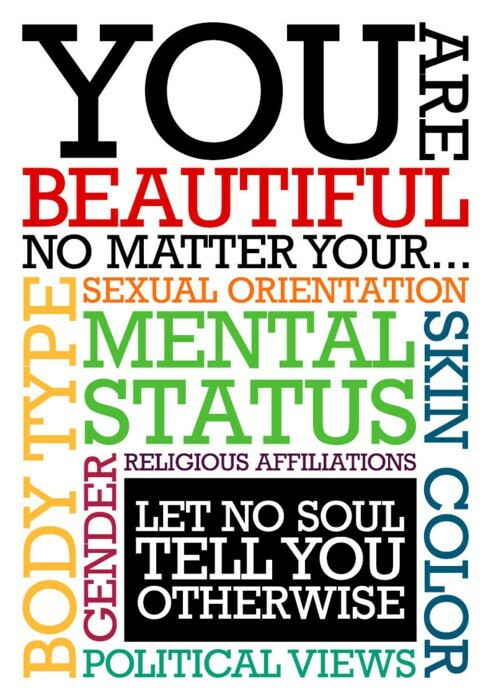 Every single one of us is beautifully and wonderfully made. Lately, I've seen story after story of heartbreak. A man with Down Syndrome goes to the movies, Zero Dark Thirty, and ends up dying at the hands of security guards -- he didn't want to leave the theater. He didn't want to pay for another ticket. He paid with his life. Why? Because no one could see his beauty. They couldn't or wouldn't take the time to really see the situation or know the pain. They wanted him out...at any cost. He wasn't worthy of their time or effort. There was the teacher who recently stated that people who are homosexual have no reason for living. Honestly, I wish I was kidding. Really?? A teacher? Too blind to see beauty in another person. Too deaf to know that laughter or kindness don't have a language or a sexual orientation. Every single person on the planet is beautiful. Yes, even the retarded. The broken. The disabled. The gay. The homeless. The frightened. The overlooked. The depressed. The sick. Once we can notice our own beauty, we can notice it in others. Once we stop hating ourselves, we can offer a bit of love to others. 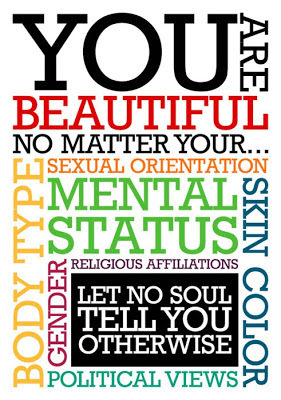 Let's stop and teach it to our kids...we are ALL beautifully and wonderfully made. love yourself. So your kids can love themselves. So all of this can melt away. I dare you to be blind to his beauty. I dare you to say that he isn't absolutely stunning. I dare you to watch this video without seeing a new world. His name: Nick Vujicic. His message:You are beautifully and wonderfully made. Can't wait to hear how you share your beauty...your grace...your life. something to love and something to hope for." I call this quote "the stool of life". This three legged chair will take you anywhere with a happy heart. If you find yourself a bit off (or your children), tick down the list...do you have something to do? Something to love? Something to hope for? Usually, one of these things is missing if you are feeling blue. And that leads me to my "something to love". I know you love somebody...probably several somebodies. Take the time. Stop right now and do it. Make a crazy love sick video. Take a walk with them. Write a note on the mirror with soap. Leave a secret post-it in the car. Read a poem to them. Make a sentence out of conversation hearts. I'm tired of the couples taking over this holiday. as Patrick likes to say: "Your one true love." But if you're single, there are still people you love. Let them know. As you can probably tell, I like to write. I live for the love note. So my valentine tradition is writing 15 love notes to each person in my family. Tiny colored paper hearts holding my most cherished memories or moments I have loved with that person this year. I write them, even if I'm not feeling it...even if it takes me a few hours to think of those 15 things...because guess what? You can't help but find it again. You can't help but recognize the gift that the person is in your life. You can't help but end that time feeling hopelessly grateful for their love; their spirit; their essence. 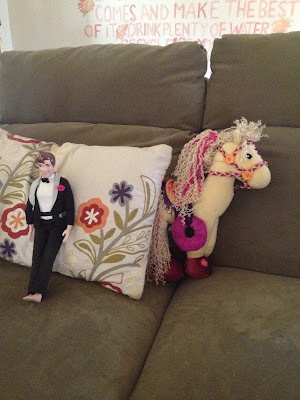 I tape them to ribbons and hang them in their doorway. They wake up to a waterfall of hearts. Yes, even if they can't read, I write them. Even if they might not take the time to read them, I write them. Even if it seems pointless I write them. Because it's not a waste to me. I think I get more out of my ribbon hearts than my sweet family members do. You see, somehow by writing the notes, I find my way back to the heart of what matters. The trail feels like a round and pointy journey...but it makes sense. I can hear their laugh again. See the twinkle in their eyes. For a crystallized moment, it all makes sense. I'm sending you a heart-filled envelope today. And please...help me add to my list. How do you share your love? Would that we could choose it. Wouldn't it be great if we could go around and say, "I choose to be strong of soul." "Today, I choose to be strong of body." But it doesn't seem to go that way. It seems that the very people who are not very strong in body seem to have a strength of soul that inspires and educates. Personally, that strength of soul is seen on the 21st chromosome...no doubt. Those kids with a little bit extra are tough...not just kind of tough...inner tiger tough. barf-o-rama. Almost 12 straight hours of vomiting. He weathered it like a sailor. He could have gone eight more rounds. I was on my last leg. Next came fever and a sore throat. I was along for the ride...just as sick. I could barely drink. Patrick called it "a frog in my throat". Dealing with strep throat, good-naturedly, he drank tea and smoothies and tried yogurt or soup. I longingly dreamt of popcorn, salad and crunchy chips. He accepted the circumstance with grace, as usual. I'm so glad he's in my life. Still learning the lessons of how to live and how to be strong of soul from a boy. Patrick is one tough guy. It is astounding. And, I swear it is the same for other kids I know with that extra 21st chromosome. My friend's baby girl dealing with cancer and every kind of crappy chemo they can throw at her and still she keeps dancing. How about Renee, born with both Cystic Fibrosis and Down Syndrome? What are the odds? What are the chances? How do you think she lived her life?? Swimming and playing and loving the people around her with a strength that humbled every doctor and nurse and person whose path she crossed. How about the orphans with Down Syndrome waiting to be loved for literally years...holding on...and then blooming under the sunshine of a family. Perhaps it is because people with Down Syndrome have centuries of history of having to tough it out on their own: isolated, abandoned, discarded. Perhaps at the cellular level they have a strength that took eons to develop. Maybe it was borne out of adversity and now it hangs on as a demonstration of the singular goal of every human: strength of soul. I don't know. What I do know is that people with Down Syndrome have an inner strength that sees them through a lot of crap. They have an inner reserve that somehow manages to hold them through adversity and difficulty that would make most of us cower. They use the moment to pour out grace and kindness. Like some sort of mystical Buddha, they get zen. They smile and dance when no one on the planet believes they possibly could. I know who I'm betting on when the going gets tough. "Only the weak are cruel. Gentleness can only be expected of the strong."